Sorry to see producer Al Brodax's passing even though he was 90. I'm guessing he was one of the most important people in Beatle lore that no one has ever heard of. At least he didn't die. Right. He just passed on to a different form - a Nowhere Man . I read a book about the creation of this film and Al Brodax was not responsible for any of the good things in this movie. In fact the people who made it basically had to work against him and then he took credit. The only thing he is responsible for is releasing the film. If it were left up to him it would have been a continuation of the TV cartoon series. The book is called Inside The Yellow Submarine , by Dr. Robert R. Hieronimus. I remember learning that Brodax had also written his own version of events and being dissuaded from reading because supposedly it was full of mistruths intended to make himself look better than he was. 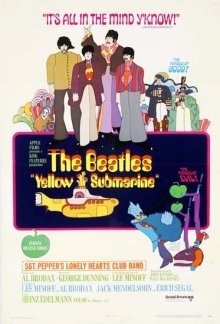 That reminds me a lot of the Phil Spectorization of The Long And Winding Road and that if George Martin had produced Let It Be , the song would've been a simple piano/guitar/bass/drums formula, although I will admit I prefer Yellow Submarine over the TV show. I think without George Martin's coperation and help the film could have ended as a complete failure. At Abbey Road , Martin let Coates, Dunning and the animation director Jack Stokes hear the as yet unreleased Sgt Pepper album, as a bit of insight and inspiration into what the Beatles were doing, given the Beatles lack of enthusiasm or participation in the project - mostly due to their dislike of The Beatles cartoon series under Brodax. Hearing it blew them away and with the help of Heinz Edelmann's brilliant artwork/direction it succeeded in adding significantly to the cultural tsunami of the Beatles. No Yellow Submarine ? - No Simpsons. I love the psychedelic art work of the mid sixties with it's art nouveau/surreal/pop art influences and this film has all of that. I think without George Martin's coperation and help the film could have ended as a complete failure. I honestly think everything about YS was a failure. Maybe failure is too strong a word, but I could never get into the film, and the album itself hardly gets any love, especially side 2! Although there a couple of flaws, the movie is still a classic and is in my opinion the best film The Beatles ever released. It should have been a disaster, 11 arduous months and way too many people involved, but Edelmann's almost round the clock overseeing (of the artwork) kept it cohesive. It's all beautiful, but my favourite sequence has to be Lucy In The Sky With Diamonds and George Dunning was mostly reponsible for that, I did read that the rotoscoping technique he used for that sequence involved some painting over footage of Joan Crawford from a film called Dancing Lady. The Beatles last minute involvement was at least a recognition to the artists that paid tribute to them through this film. I like this one and A Hard Day's Night the best, although you could argue that A Hard Day's Night is actually more of a Beatles film. One part I've noticed that's different on both the Blu-ray and the previous '99 DVD edition from the version I watched in my youth that had been recorded off a local TV channel when it had been on in the wee hours one night: as The Beatles are releasing Sgt. Pepper's LHCB from their 'meanie bubble,' "Baby, You're a Rich Man" begins to play on the soundtrack (as in the international cut) and as the bubble is deflating the song continues to play. But then the group starts singing up through the line 'What do you want to be? ', and then the action resumes. However, in the DVD and Blu-ray version, once the bubble starts deflating, the soundtrack goes to silence and then cuts straight to the action from where the group had stopped singing. This was presumably the U.S. cut which lacked the "Hey Bulldog" segment, since that definitely wasn't there... and I'm assuming this scene was going to be segment in which "Baby" appeared since it was initially going to be one of the 4 exclusive Beatle songs for the movie's soundtrack but work was then stopped on the scene when the group yanked it from their submission list and put it on the B-side of "All You Need Is Love" instead (which led them to have to eventually include "Hey Bulldog"). But why would this have appeared in one version of the film but not the other? you could argue that A Hard Day's Night is actually more of a Beatles film. Yeah, absolutely, as far as that goes...it's taking the "extras in our own movie" aspect of Help ! (as well as that film's imaginative art direction and musical-visual interpretations) to some kind of conclusion, right along with the increased air of mind-expandedness around the music itself over the same time frame. Because they were looking to fulfil their contract with United Artists for a third film with as little effort on their part as possible. They thought YS would do that if they provided new songs and did a cameo at the end. It didn't, hence LiB ending up as a United Artists film instead of the TV special it started out as. I dunno, if the Beatles had done them, they would've been even worse, even though the accents would've been real. They didn't have any voice acting training and (I think) the film would've been a lesser success because of their lack of training. @Evangeline: that's a good point actually. I'd never thought of it like that. Cheers! Didn't the Beatles hate the TV cartoon about them? Could that have also been a factor in why they didn't really participate?